During the Jacobite rising in 1745-46, Kenneth MacKenzie, 6th Earl of Seaforth and later known as Lord Fortrose, supported the government and did not bring his clan out for Bonnie Prince Charlie. He had seen the many sufferings of his father and his clan from the prior Jacobite rising and chose to preserve the status quo. He did not lead the MacKenzies or the MacRaes into battle. George MacKenzie, 3rd Earl of Cromartie together with Simon Fraser, Lord Lovat made a joint recruiting effort in the east around Glenurquhart on the Black Isle, and took part in the Battle of Falkirk on 17 January 1746. Many MacKenzies fought in his regiment but very few MacRaes, perhaps because their population was greater in Seaforth's domain. Both the Earl and his son Lord MacLeod were taken prisoner the day before Culloden. They were later pardoned, but Lord Lovat was also taken prisoner and was executed with great barbarity at the advanced age of 80 via the method known as hung, drawn, and quartered. He was the last nobleman executed in Britain. 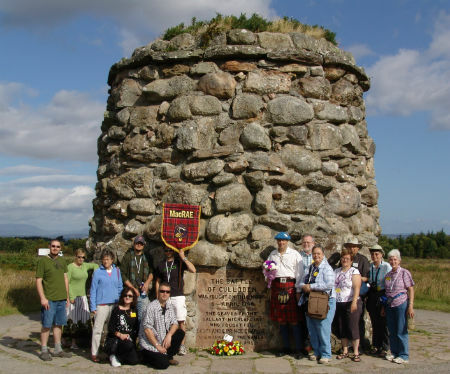 The majority of the men taken at Culloden were either executed or transported. As a result of Seaforth's non-participation and Cromartie's recruiting being in the east and not the west, very few MacRaes fought in this decisive battle. The English never claimed battle honors for the Battle of Culloden, perhaps in shame at the butchery by Cumberland, the King's son, whose policy was give no quarter. Fallen soldiers were murdered where they lay wounded on the field. Of the English who attended the public executions in Carlisle and London, it is said that many turned away. It is hard to believe how savagely the Scots were treated in defeat during the alleged Age of Enlightenment, and historians who want to understand the causes of the American Revolution can look to the aftermath of this one battle and take note of the many Scots names who led America to independence.